The Value Sorter will improve neatness and is a great addition to any mail room, office, school or store. 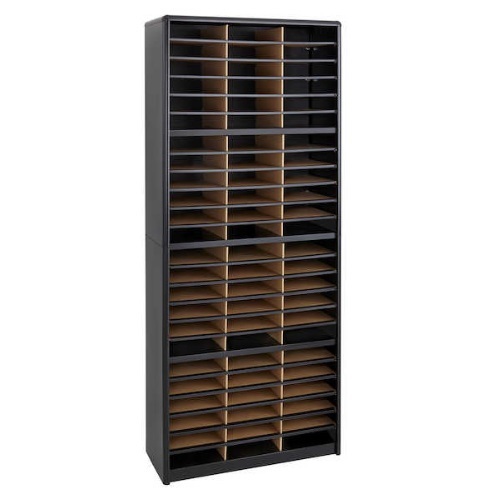 Use compartments as a mailbox, material holder or stationary sorter. The steel shell comes complete with support shelves and a solid fiberboard back to ensure stability and durability. Compartments are formed with heavy-duty corrugated fiberboard. Unit has over-sized compartments that comfortably hold up to 550 sheets of letter-size paper. Compartments are wide enough to easily accommodate letter-size file folders. Wide shelf fronts have built-in label holders (labels included).